Friends staying over + Late night cravings = Gather all ingredients and start baking! An easy yet detailed pizza recipe. METHOD FOR DOUGH: In a bowl mix flour, sugar, salt, oil and instant yeast. MIx it well. Then add remaining ingredients of dough oregano, corn, pizza sauce, cheddar cheese and mozzarella cheese and make a soft dough. Leave to rise until doubled. METHOD FOR PIZZA OIL: Put a sauce pan on flame and put all the ingredients of pizza oil which are mentioned above. Cook it on low heat for 10 minutes. Then remove from the flame and keep it aside. 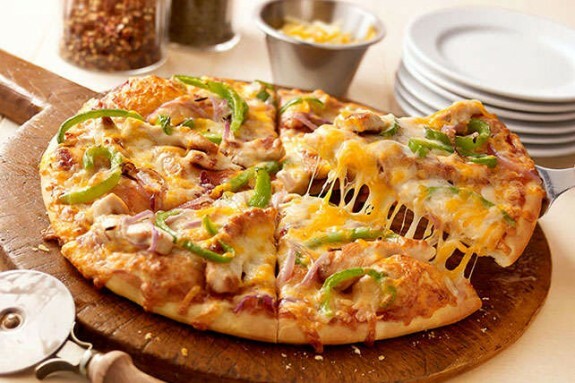 To assemble pizza, roll pizza dough put on a pizza plate and brush with pizza oil on the base. Then spread pizza sauce 2 tbsp, sausages, smoked chicken, onion cubes, olives, mushrooms, oregano both the cheese and bake on 200 degrees for 25 minutes. Take out from the oven and serve hot with ketchup.